Trees Indiana has partnered with Northwest Allen County Schools to offer the entire community and surrounding region an innovative outdoor learning space designed to provide youth with positive experiences that can help shape their lives. Trees Indiana uses the American Electric Power Foundation Nature Explore Classroom, which is located at Cedar Canyon Elementary School, year-round for programming and as a field trip site. 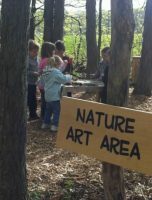 In the spring of 2011 Trees Indiana was awarded a major gift from the American Electric Power Foundation for the design and construction of a Nature Explore Classroom. 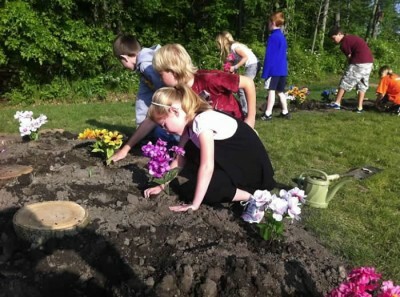 This outdoor classroom uses Nature Explore research-based, field-tested principles proven to support comprehensive and effective outdoor learning. Natural materials are used throughout the new outdoor classroom. A variety of native Indiana trees have been planted along the entry pathway leading to beautiful woods of shagbark hickory trees. Two tulip trees, the state tree, were planted at the entry and a fallen ash tree provided ample branches for an arbor. Colorful wildflowers are also abundant throughout the forest. Everything along the pathway is used for teaching. Recycled materials have been used throughout the classroom and all areas were created amongst the existing trees. Mulch covers the pathways and activity areas while signs help children remember the layout of the space. Tree cookies, pine cones, leaves, seed pods and acorns are just a few of the components that spark children and families to create masterpieces and connect them to nature. Concrete was personalized with leaves and children’s handprints, adding interest to an otherwise blank surface. A community-wide Open House was held last April to officially kick-off the opening of the Nature Explore Classroom. Over 200 people came out to celebrate the Nature Explore Family Day, which was officially proclaimed by the Mayor of Fort Wayne.